Very quickly, and very briefly, before we get started, I need to stick to tradition and mention that I got a C in Organic Chemistry 2 over the summer, which puts me at a cumulative average of 3.525 on 70 credits; the old concern with the old OChem 1 grade being counted has been resolved. ChE 0300 Transport Phenomena 6 cr. ChE 0301 Transport Phenomena Laboratory 1 cr. ChE 1085 Departmental Seminar 0 cr. ChE 1530 Biochemistry for Engineers 3 cr. ENGR 0022 Materials Structure and Properties 3 cr. MUSIC 0311 Introduction to World Music 3 cr. MUSIC 0612 Heinz Chapel Choir 1 cr. MUSIC 0630 Marching Band 1 cr. Classes begin 25 August 2008; final exams are 8-13 December 2008. No classes 1 September for Labor Day; no classes 13 October for Fall Break, Monday classes instead observed on 14 October; no classes 26-28 November for Thanksgiving Recess. As you can see, I have nice big open afternoons. I'm not sure what to think of it yet, but I have the feeling it's a good thing, because I can do errands, do homework, do internship searches, or whatever else needs to be done during that time. I'm still not used to the fact that my ChE courses are at 10:00 and not 08:00 yet, but it means that instead of my friends and I going out for bagels afterwards, we go out for lunch. Which is a lot of fun. 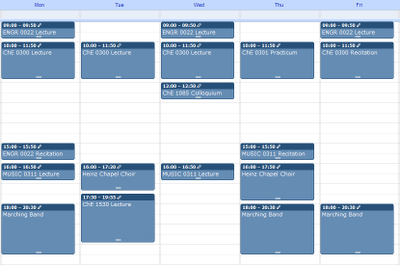 The only thing I don't particularly like is the ChE 1530 (BioChem) lecture that spans Tuesday nights. It causes me to miss the last half-hour of choir, miss all of band, and risk missing my meeting for ΜΚΥ in the event that band should let out earlier than normal, which I'm sure will happen on at least one Tuesday between now and November. Fall break is a bit of a complicated thing, too. Because we miss a Monday for Labor Day; and we miss a Wednesday, Thursday, and Friday for Thanksgiving Recess; it makes sense to miss a Tuesday for any Fall Break we might have. But you can't just call off a random Tuesday, so we're going to call off Monday and then make up the Monday classes on Tuesday in lieu of the Tuesday classes, effectively canceling the Tuesday classes even though we have Monday off. I am envisioning mass chaos on those days. All in all, I think that this can and will be a good term. I'm doing well on forming good habits, although it hasn't even been a week yet, so we'll see how everything holds up once it comes time for midterm exams. Random tangent: Pitt's Bonfire & Pep Rally is tonight at 20:30; I will be playing there. And apparently, my grandfather won tickets to tonight's Steelers preseason game and is taking my father. So that's exciting. I think your schedule looks scary haha. Not the actual schedule I suppose, but the classes. I like having the afternoons/evenings off. I changed my one class' time so that it would not be in the evening (it was disrupting my organization/club schedule). It is odd that you do that Monday off to compensate for the miss of Tuesday...at MSU they just deal with it...haha.